The Department of Energy (DOE) on Thursday (18 May) held recognition rites at Mindanao State University-Marawi for partners and donors who have helped rebuild war-torn Marawi. “We did not abandon Marawi, we will never abandon Marawi, and we will continue doing the rehabilitation of Marawi,” the Energy chief emphasized. “We had given all our ground personnel during the Marawi siege support, including security assistance from the military and even food,” he added. 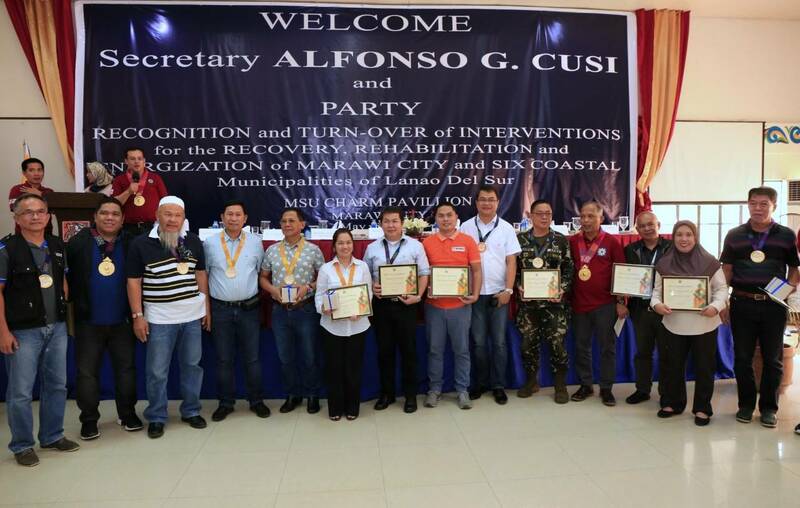 Cusi commended the heroic efforts of Task Force Bangon Marawi, Armed Forces of the Philippines, Association of Mindanao Electric Cooperatives, Philippine Rural Electric Cooperatives Association, Inc., National Grid Corporation of the Philippines, National Power Corporations, National Electrification Administration, and Lanao del Sur Electric Cooperative in securing the energy facilities, rehabilitating generation plants as well as transmission and distribution lines, and in ensuring the safety of all those helping in protecting and rebuilding the Marawi City. The Energy chief also acknowledged the donations and support given by One Meralco Foundation, Aboitiz Power Corporation, Liter of Light, Pepsi Philippines, PHINMA Energy Corp., and the United States Agency for International Development- B LEADERS to the energy sector in Marawi City.